Police investigate the discovery of a letter containing white powder that was delivered to Congregation Adath Israel on Broad Street in Middletown Wednesday afternoon. 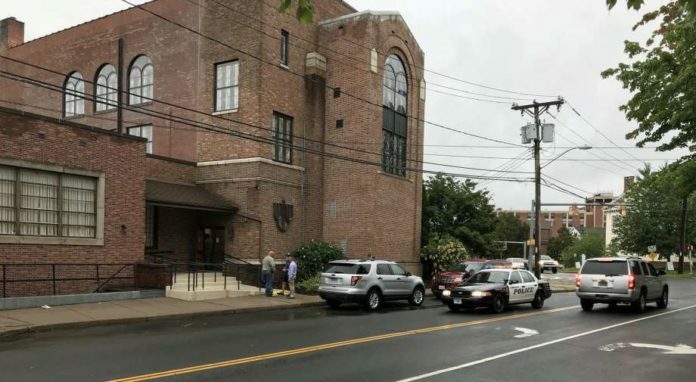 MIDDLETOWN — Local police and fire departments were called to a city synagogue Wednesday on the report of a powder-type substance in a letter, according to Middletown police. Authorities are investigating the discovery at Congregation Adath Israel at 8 Broad St. and believe the occurrence to be related to white powder incidents in Hartford last week, police said. The suspect in the previous incidents is incarcerated and police said there is no threat to the public. A female employee was opening the mail during the late afternoon and found white powder in one of the parcels and called authorities right away, synagogue president Jonathan Shapiro said Thursday morning. “Everything seemed to be pretty consistent” with the pattern of letters found last week in Hartford and Old Saybrook, he said. “We were told not to worry about it. It was sent for testing, and we’re open for business as usual. I think if it was an isolated incident, and if we didn’t have the assurance and reassurance (that it was part of a larger attack), I think everybody would feel differently about it,” Shapiro said. Gary Joseph Gravelle, 51, charged with a federal supervised released violation, was arrested Sept. 5 by New Britain police and the U.S. Marshals Service Violent Fugitive Task Force. 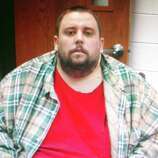 He is believed to have mailed numerous letters to agencies and departments across the state. Gravelle appeared that same day before U.S. Magistrate Judge Robert M. Spector in New Haven and was ordered detained, according to a federal release. The FBI, U.S. Postal Inspection Service, U.S. Marshals Service, Connecticut State Police, Hartford Police Department and New Haven Police Department, in coordination with other federal, state and local law enforcement and emergency services agencies, are investigating several incidents involving letters containing white powder that were mailed to government facilities and non-governmental organizations in Connecticut and elsewhere in the country, according to U.S. Attorney John H. Durham. “According to statements made in court, Gravelle is under investigation for sending multiple threatening communications, and for mailing multiple letters containing white powder to several federal and state offices, and community organizations,” this month, the release said. “It is alleged that many of these letters were mailed by an individual who has been in federal custody since his arrest, for alleged violations of his supervised release Sept. 5,” Durham said. A similar incident took place the morning of Sept. 7 at the Community Health Center in Old Saybrook. A CHC spokeswoman at the Middletown headquarters confirmed the company received the package. Through the course of the overall investigation, investigators have seized unmailed letters, notified numerous potential recipients of letters, and successfully removed some letters from the mail stream prior to their delivery. However, letters continue to arrive in various locations, according to the release. “Although the seized and retrieved letters have caused no illness or injuries to date, we strongly urge anyone who receives a suspicious letter or package not to handle it further, and immediately call 911. This will permit law enforcement and emergency services personnel to investigate the matter safely,” Durham said. State police officials from Troop H in Hartford responded to the offices of the Connecticut State Department of Education in the State Office Building at 450 Columbus Boulevard in Hartford Sept. 5 at 11 a.m. on a report of a suspicious package containing white powder, according to a press release from the state Department of Emergency Services & Public Protection. Shortly afterward, both the State Police Emergency Services Unit and Bomb Squad, the FBI, state Department of Energy and Environmental Protection and Hartford police and fire departments responded, the release said. No injuries were reported and at least two packages appeared to contain baby powder, according to the Associated Press. Each delivered package contained an unknown white powdery substance and no one who has had contact with the substance has experienced illness or injury, the release said. In July 2013, Gravelle was sentenced in federal court to 70 months in prison and three years of supervised release, for mailing numerous threatening letters. He was released in November 2015 and allegedly “failed to comply with certain conditions of his supervised release, including failing to notify the U.S. Probation Office of a change of residence, and failing to comply with a mental health treatment requirement,” the release said. In 2013, officials said Gravelle, also known as Roland Prejean, sent more than 50 threatening letters in early September 2010, including one that caused an anthrax scare and another saying he had planted a hidden bomb on a remote timer inside the Thomaston Post Office. The federal release from Gravelle’s 2013 sentencing said: “According to court documents and statements made in court, in early September 2010, Prejean mailed a threatening letter to the Thomaston Post Office claiming that he had planted a hidden bomb on a remote timer in the Post Office. The FBI has taken over the Middletown investigation. Calls and emails to the FBI spokesperson were not immediately returned.